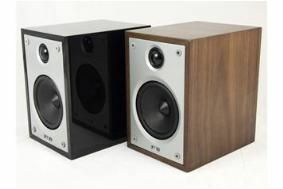 BRISTOL SHOW 2011: Acoustic Energy unveils Compact mini monitor | What Hi-Fi? Making its debut at the Bristol Sound & Vision Show this weekend, AE boldly claims the design will "shake up the budget loudspeaker market this year". We shall see. Despite its small dimensions, the Compact has a traditional MDF cabinet with extensive bracing, a "clean signal path crossover" and two all-new drivers. The soft-dome tweeter combines with a wood fibre mid/bass driver using AE's conical dust cap to deliver "a rhythmic and tuneful sound", the company says. The Compact 1 shown here will be joined later in 2011 by the Compact Centre and Compact Sub to make up a 5.1 surround system. All will be available in either piano gloss black or real wood veneer finishes. To find out about all the other big product launches at Bristol, see our show preview.